Walnuts... Sugared and Toasted. A generous scoopful on English Walnuts, toasted and sugared, give these classic cake-style brownies that extra special taste of goodness. 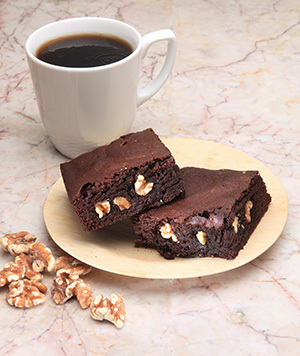 Baked right in, a generous helping of sugared and toasted English Walnuts give this fabulous brownie its unique, one-of-a-kind taste. YOU CHOOSE THE DATE WE BAKE AND SHIP YOUR ORDER!! Our policy of only baking to order insures that your order will arrive freshwith that better-than-homemade taste.